Pulse quickly for 4-5 short pulses. You will start to see it whiten and come together, then pulse for 10 seconds. Wait a few seconds and pulse again for 10 seconds. Add your last tbsp of oil and repeat #3, pulsing only for 10 seconds at a time, until thick and creamy. The mayonnaise is challenging! The first time I tried it, it was very runny. Not mayonnaise texture at all. I tried again, using only the egg yolk (since this seemed more common in other recipes). It was thicker, but not like store bought mayonnaise. The taste was good though! I've also seen in other recipes that the egg needs to be at room temperature, which mine was not. This is definitely a recipe to keep working on, since it would be great with other meals, like hard boiled eggs, with fluffy potato rolls, etc. I will keep trying! I made a few modifications to the crab cake recipe. I had fresh crab (not imitation), so I was able to use that. I did not have some of the spices, herbs or roasted red peppers, so I used basil, paprika, garlic salt, pepper and sea salt. The crab cakes were amazing!!!! So tender and moist (and mayonnaisy) on the inside, yet crispy on the outside. The flavours really came together in these four big crab cakes. Very generous serving. I used 6 oz of crab meat, but could have used less for a very satisfying meal. I laid them over spinach, which nicely wilted some leaves while leaving some crispy. This meal was very delicious, despite using most of my protein, oil, and 1/2 packet for the day. I am still very full, a couple of hours later. A smaller portion would have been fine, and that's probably what I will do next time. And I'm definitely making sure I have roasted red peppers when I make them again, since I think that would be a great flavour combination. 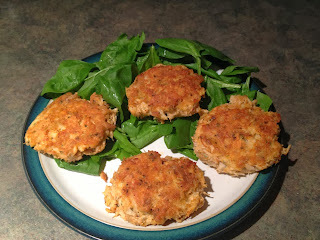 :) Can't wait to try recipe for crab cakes! if you have been on ideal protein since 2012. how are you doing on your weight loss journey?